It could only happen in Didsbury………..
We were invited to a flower opening. Yes really! It was an urgent phone call- this most important annual event was imminent. 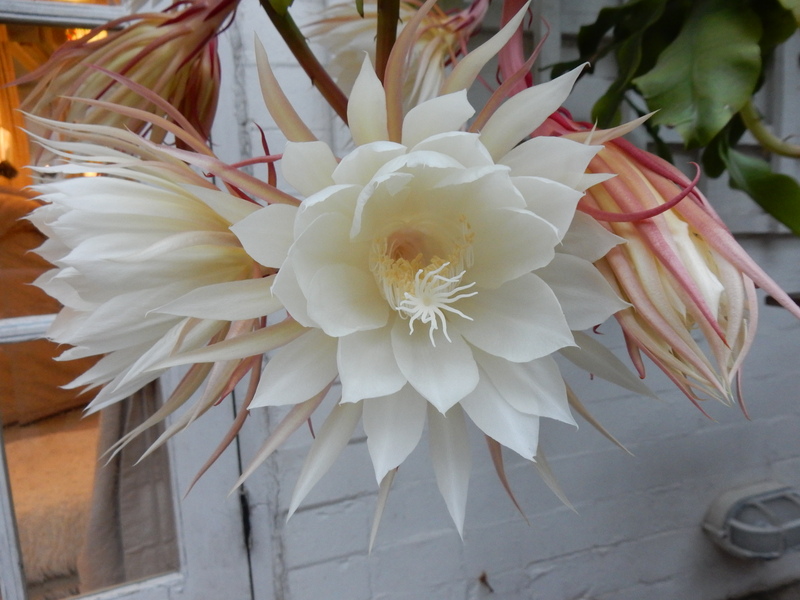 Apparently the buds of Epiphyllum oxypetalum were showing every sign of opening within the next few hours so would we like to come and witness this remarkable event? Of course we would! We kept popping back into the conservatory to monitor progress of the buds opening. ‘Queen of the Night’ is the common name for this gorgeous member of the cactus family because she struts her stuff for just one night only- just like the diva that she is- and then the flowers die within an hour of sunrise. Just enough time for night flying bats and the sphinx moth to pollinate them . And those flowers, and that scent! She certainly is ‘Queen of the Night’ and what a privilege to witness her glorious opening night. Make sure you put googly eyes on them.